Mark Brnovich (born November 25, 1966) is an American lawyer and politician from the state of Arizona who currently serves as the 26th Attorney General of Arizona. A member of the Republican Party, he was elected to the office on November 5, 2014, defeating Democratic nominee Felecia Rotellini. Brnovich advanced from the August 28, 2018 Republican primary as the top vote-getter in the state, running unopposed. Brnovich's family is originally from Montenegro. On November 6, 2018, Brnovich defeated Democrat January Contreras to be elected to a second term as attorney general. Brnovich is married to Susan Brnovich, a former Maricopa County Superior Court Judge who was nominated by President Trump in January 2018  and confirmed by the United States Senate as a United States District Judge of the United States District Court for the District of Arizona in October 2018. 4.3 $4.65 million dollar consumer fraud settlement with Theranos, Inc.
Born in Detroit, Michigan, Brnovich moved to Arizona at the age of two. Brnovich's mother was born in the former Yugoslavia and legally emigrated to the United States. He often notes that his mother emigrated to the United States to flee communism. He is Eastern Orthodox and is of Serbian descent. Brnovich received a bachelor's degree in political science from Arizona State University and his juris doctor from the University of San Diego School of Law. While at Arizona State, Brnovich was a member of Sigma Pi fraternity. 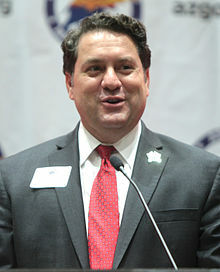 Brnovich served his country as a member of the Army National Guard, has worked as the Director of the Center for Constitutional Government at the Goldwater Institute, briefly for the Corrections Corporation of America, served as Assistant U.S. Attorney for the District of Arizona, a prosecutor with the Maricopa County Attorney's Office, and Assistant Attorney General of Arizona. He was appointed the director of the Arizona Department of Gaming in 2009. He served in the role through 2013, when he resigned to run for Attorney General of Arizona in the 2014 election. He defeated incumbent Tom Horne in the August Republican Party primary election and Felecia Rotellini in the general election. Brnovich personally argued in defense of the "one-person, one-vote" principle before the United States Supreme Court on December 8, 2015 in the Harris v. Arizona Independent Redistricting Commission case. In May 2017, Brnovich provided the commencement speech for the University of San Diego, his alma mater. Brnovich was one of only two Republican politicians to address graduates at the universities ranked in the top 100 by U.S. News & World Report. Brnovich served as the Chairman of the Conference of Western Attorneys General, a non-partisan organization of Attorneys General from 15 western states, three Pacific territories, and 13 associate member states from 2017-2018. Brnovich chose to focus his Chair's Initiative on cyber security and data privacy. In August 2017, Brnovich was appointed to a bipartisan working group of state attorneys general titled "Protecting America's Seniors: Attorneys General United Against Elder Abuse." The National Association of Attorneys General (NAAG) presidential initiative was established to focus on strengthening efforts nationwide to combat elder abuse. In December 2017, Brnovich was recognized by the Arizona Capitol Times as a "Leader of the Year" in the category of Public Safety. In recognizing Brnovich, the Capitol Times stated: "But it's his non-political work in the area of law enforcement and consumer protection and advocacy that is earning Brnovich a lot of praise. In addition to going after fraudsters and scammers, Brnovich has zeroed in on the opioid epidemic, busting suspected opioid rings and in a bold move, charging a major manufacturer of the drug of deceptive practices designed to reap profits at patients' expense." In August 2016 the Arizona Attorney General's office took action in Maricopa County Superior Court and filed to intervene in over 1,000 lawsuits from an "advocacy" group that flooded courts with "copy and paste" disability access lawsuits targeting mostly small businesses. By intervening, the Attorney General's office made itself a part of the cases and argued that group, "Advocates for Individuals with Disabilities," exceeded their legal authority and that the group was not allowed to collect fees on these types of lawsuits. A judge agreed to allow the Attorney General's office to intervene and consolidated the cases while also preventing Advocates for Individuals with Disabilities from filing new lawsuits in September 2016. In December of that year the office filed a motion to dismiss the lawsuits. A judge granted the Attorney General's office request in February 2017, dismissing over 1,000 of the lawsuits. After the successful action by his office, Brnovich remarked: "Arizona is not going to tolerate serial litigators who try to shake down small hardworking businesses by exploiting the disability community." On September 8, 2017, Brnovich sued the Arizona Board of Regents, saying the entity in charge of setting tuition for Arizona universities had "dramatically and unconstitutionally" increased tuition and fees over the last 15 years. In the lawsuit, Brnovich said the Board of Regents had "abandoned its duty to serve as a check on the university presidents" by allowing an "unprecedented series of lockstep tuition hikes" that violates the state's constitutional mandate requiring tuition for in-state students at college to be "as nearly free as possible." The constitutionality challenge included an additional charge against the Board of Regents for continuing to provide in-state tuition for Deferred Action for Childhood Arrivals ("DACA") recipient students. A state Court of Appeal previously ruled in June 2017 that DACA students don't have "lawful immigration status" and therefore don't qualify for in-state tuition because of a 2006 voter-approved measure that prohibits in-state tuition and financial aid for undocumented college students. On April 9, 2018 the Arizona Supreme Court ruled in a 7-0 decision that state colleges and universities could no longer provide in-state tuition to individuals who were covered under DACA. That same day, the Arizona Board of Regents announced that they would no longer be providing in-state tuition for DACA students in upcoming semesters. $4.65 million dollar consumer fraud settlement with Theranos, Inc. In April 2017, Brnovich announced that every Arizonan who had obtained a blood test from Theranos, Inc. between 2013 and 2016 in the state would receive a full refund as a result of a $4.65 million dollar consumer settlement with the Attorney General's Office. Theranos was sued under the Arizona Consumer Fraud Act, including specific allegations that the company's advertisements misrepresented the accuracy and reliability of the more than 1.5 million blood tests sold during that period. Theranos was also banned from owning, operating or directing a lab in Arizona for two years as a result of the settlement. In December 2017, checks were distributed to more than 76,000 Arizonans who received a full refund with an average refund per customer of $60.92. In March 2018, the state announced that a consumer fraud settlement had been reached with General Motors ("GM") that would pay an additional $6.28 million in payments to Arizona consumers as part of claims related to GM's installation of faulty ignition switches. The settlement impacts 33,000 Arizonans who purchased certain cars between 2009 and 2014. According to Brnovich, Arizona was the first state to obtain restitution directly for consumers as part of a settlement with GM related to faulty ignition switch claims. GM previously settled claims with 49 other states, but Arizona filed their own lawsuit focusing on consumer restitution. Under that lawsuit, Arizona would have received $2 million and they money would not have gone to consumers. In May 2018, Brnovich announced that Volkswagen ("VW") agreed to settle a consumer fraud lawsuit with the State of Arizona for $40 million dollars over its diesel emissions scandal.The settlement directed $10.5 million to Arizona consumers who had purchased certain VW, Audi and Porsche vehicles for restitution, $20 million to the state's budget to help fund K-12 education, and the remaining money for consumer protection and enforcement purposes. Arizona is the only state to obtain additional restitution on behalf of consumers as a result state enforcement actions. The Arizona Supreme Court ruled 7-0 on April 9, 2018 that state colleges and universities could no longer provide in-state tuition to individuals who were covered under the Deferred Action for Childhood Arrivals (DACA) program. In doing so, the Court upheld a legal challenge initiated by former Attorney General Tom Horne and continued by Brnovich against the Maricopa County Community College District. The ruling applies to all community colleges and universities within the state. In their decision, the justices upheld a previous 3-0 decision from the Arizona Court of Appeals that said the state hadn't explicitly granted in-state tuition to DACA recipients and that the colleges policy was against Arizona law. Specifically, Proposition 300, a 2006 law passed by Arizona voters with 71.4% of the vote that stipulates state-funded services and benefits such as in-state tuition cannot not be provided to individuals without legal status. According to Legal Newsline, Brnovich has targeted scammers to protect small businesses in Arizona. He shut down an unscrupulous attorney named Peter Strojnik who was "filing dubious disability access lawsuits against small businesses." After Brnovich's investigation, Arizona law was changed to ensure those types of scams won’t happen again. According to published reports, the Attorney General's Office discovered another 9,000 ADA lawsuits Strojnik was preparing to file against Arizona businesses. On September 11, 2018, The Washington Post reported that Brnovich was investigating Google for its alleged practice of recording consumers' tracking data even after a consumer opted out of the location tracking function. ^ "Trump nominates Susan Brnovich, Arizona AG's wife, to federal judgeship". The White House. Retrieved 2018-01-24. ^ "Senate Confirms Susan Brnovich as Federal Judge in Phoenix". Archived from the original on 2018-10-13. ^ Lemons, Stephen (2015-02-04). "Long, Strange Trip: Republican Mark Brnovich Channeled Jerry Garcia to Become AZ's Attorney General". Phoenix New Times. Retrieved 2017-08-05. ^ "Meet The Candidate: Mark Brnovich". ^ "A Yugoslavian Mother's Son – National Review Online". www.mark4az.com. Retrieved 2018-10-16. ^ a b c "Former Arizona gaming chief will run for attorney general". azcentral.com. Retrieved November 5, 2014. ^ "Notable Alumni". Sigma Pi. ^ "Mark Brnovich, ex-Department of Gaming director, to run for Arizona attorney general". KNXV. Retrieved November 5, 2014. ^ Wingett Sanchez, Yvonne (August 27, 2014). "Horne concedes attorney general race to Brnovich". Arizona Republic. Retrieved August 27, 2014. ^ "Brnovich projected to win AG". November 4, 2014. Retrieved November 5, 2014. ^ "Supreme Court Considers Arizona Redistricting Challenge". NBC News. Retrieved 2017-06-09. ^ "Democrats, Clinton supporters, Hollywood to dominate this commencement season - The College Fix". The College Fix. 2017-04-11. Retrieved 2017-06-09. ^ "2018 CWAG Chair's Initiative Agenda" (PDF). ^ "Elder Abuse Put Under Spotlight By State AGs". www.fa-mag.com. Retrieved 2017-10-09. ^ "2017 Leader of the Year - Attorney General Mark Brnovich". ^ Martin, Dave Biscobing, Shawn (2016-08-25). "Attorney General's office takes action after ABC15 investigation into ADA serial suers". KNXV. Retrieved 2017-06-25. ^ Biscobing, Dave (2016-09-27). "Judge temporarily bans new ADA lawsuits, combines previous cases from controversial 'advocacy' group". KNXV. Retrieved 2017-06-25. ^ "Judge dismisses more than 1,000 ADA lawsuits". www.bizjournals.com. Retrieved 2017-06-25. ^ "Roberts: Brnovich sues Regents over outrageous tuition costs (finally)". azcentral. Retrieved 2017-10-09. ^ "Arizona Appeals Court overturns in-state tuition for 'dreamers'". azcentral. Retrieved 2017-10-09. ^ "Arizona Public Program Eligibility, Proposition 300 (2006) - Ballotpedia". Retrieved 2017-10-09. ^ a b "Arizona Supreme Court strikes down in-state tuition for 'dreamers'". ^ "Statement from ABOR Chair Regarding Arizona Supreme Court Decision in MCCCD Case" (PDF). Retrieved April 17, 2018. ^ "Theranos to refund Arizonans $4.6M in blood testing costs". Arizona Daily Star. ^ "Arizonans get $4.6 million in refund checks from blood test company Theranos". ^ "Arizonans get $4.6 million in refund checks from blood test company Theranos". Arizona Republic. ^ "AG Brnovich Obtains $6.28 Million for Arizonans Who Purchased Recalled GM Vehicles". ^ a b "How to get $200 or more from GM recall settlement". ^ "Arizona owners of faulty GM cars to split $6.28M settlement". ^ "Arizona gains $40 million in Volkswagen settlement for consumer restitution, education funding". ^ "AG: $40 million Volkswagen settlement to help Arizona's education funds". Archived from the original on 2018-05-02. ^ "Arizona Public Program Eligibility, Proposition 300 (2006)". ^ a b Asbury, Kyla (2018-08-10). "Arizona attorney general 'true advocate' of state's job creators, industry leader says". Legal NewsLine. Retrieved 2018-08-10. ^ "Hit piece against Mark Brnovich was the work of a schemer". ^ "Google's location privacy practices are under investigation in Arizona".